Tomorrow morning we leave for a brief weekend visit to NYC. We’re taking Mimi to see the magnificent Dan Zanes perform at the Metropolitan Museum of Art — it’s her first concert! We’re also planning to eat dinners at Lupa in the Village and Mororino in Brooklyn. And, in accordance with family tradition, we’ll pay too much money for bagels at Zabar’s. Everything except the bathroom breaks are scheduled on this trip. When the time came for Mimi to eat solid food, I was excited to make simple pureés for her — mostly organic, usually seasonal. An early favorite was a combination of plain yogurt and fresh mango that we playfully called “mango-dango.” Throughout this next phase of eating, I spent many happy afternoons steaming and pureéing Asian pears, green peas, Pink Lady apples, even quince. I roasted and mashed eggplant and sweet potatoes. I smashed bananas, strawberries, and peaches as well as red beans, lentils, and boiled edamame. Later, when her pretty little teeth appeared, I steamed green beans, broccoli, and carrots, cut them up, and served them with hummus. I fed her salty bacon and smoked salmon, quinoa and couscous. I topped baked potatoes with pesto, a practice that eventually became mandatory. One happy memory is of my six-month old daughter, to the surprise and delight of my mother-in-law, greedily gobbling up a plateful of steamed asparagus at a favorite restaurant in Michigan. We ordered some extra and she polished that off as well. Even the waitress was impressed. Mimi has always been a fairly adventurous eater. She will eat almost anything that she sees her parents eat. When she was tiny, the only foods that she refused outright were infant cereals, commercial baby food, and, well, avocados. We all have our culinary quirks. 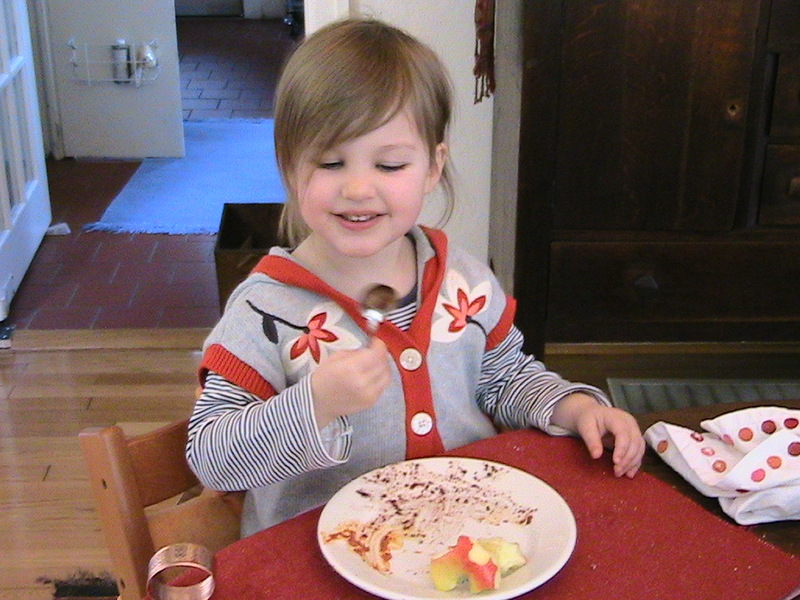 Before Mimi was born, I resolved that she would not be a picky eater, as so many children are. I was keenly aware that the odds were against us. I’m not sure when this happened, but at some point in American history, someone decided that children don’t like to eat the same foods as their parents and, moreover, that “adult” food was not even really appropriate for kids. Of course, a whole new market opened up to accommodate this trend: children’s food. These foods are marked by uniformity and infantile product names — “Go-Gurt,” “Captain Crunch,” ”Snackables,” “Spaghetti-O’s.” None of it is any good. Thus, tastes and habits are created. Presented with an array of “appropriate” foods, kids pick up their forks and they eat. But not adult food. No, thank you. Children always strive to meet our expectations — even when those expectations are impossibly low. 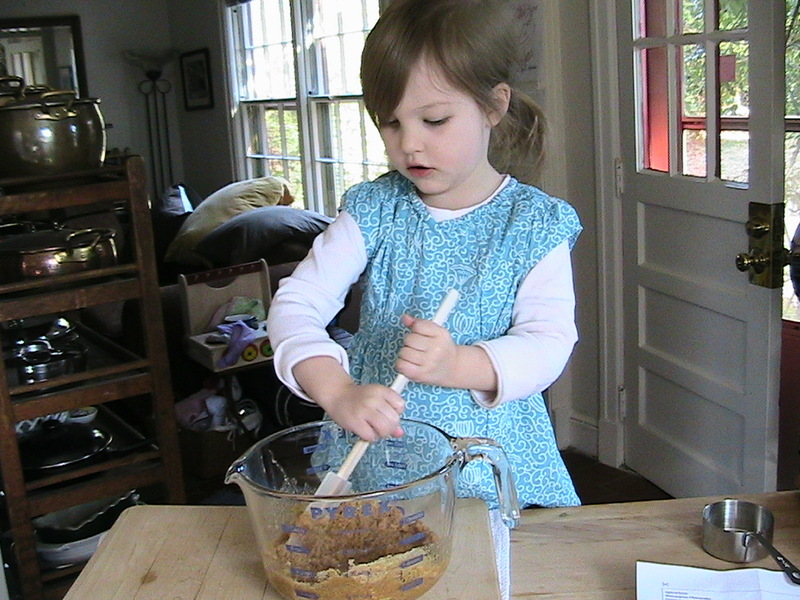 Interestingly, it is possible that food preferences become instilled even earlier than toddlerhood. Some researchers theorize that amniotic fluid — that watery substance that nurtures and protects the aquatic fetus during gestation — changes flavor depending upon what a mother eats. The flavor of breast milk varies similarly. 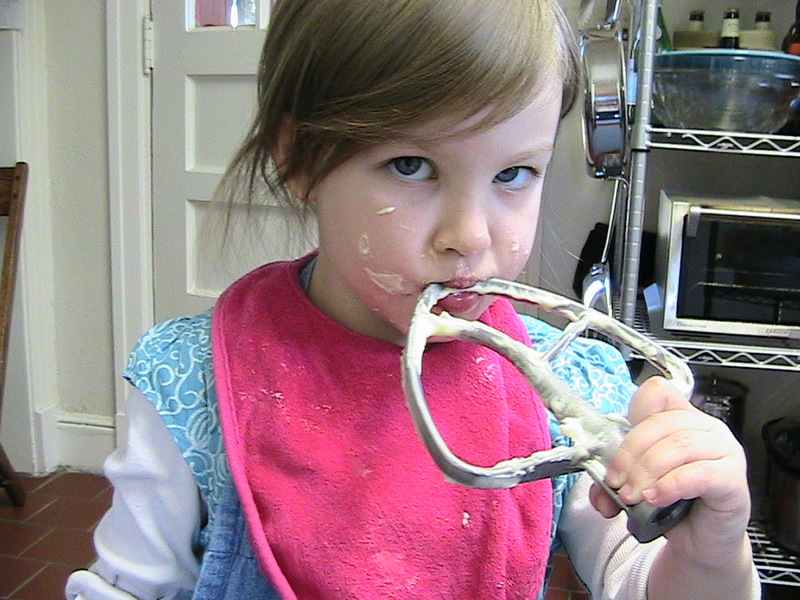 Taste, then, might be developed prenatally, at least initially, and probably long before solid foods are introduced. If true, then children’s food manufacturers have already tailored the tastes of at least one generation of American eaters. It occurs to me that the menus of several major American food chains support this theory. How different are the adult and children’s menus at Applebee’s? Back when I was pregnant and nursing, I was especially concerned with eating as many different things as I could so that Mimi’s palate would be as varied as possible. I liked to imagine Mimi, tucked away inside of me, wondering what new flavor experience would come next. I made sure to eat a lot of broccoli, hoping to raise a lover of that unfairly maligned vegetable. It seems to have worked. Mimi likes her little trees. 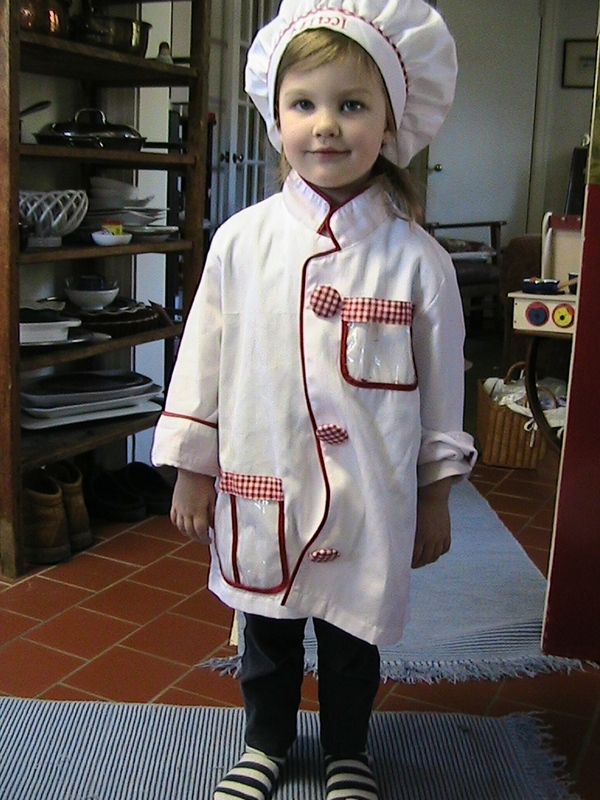 Now that she’s older, Mimi will often ask me what’s for dinner and then, when she finds out what we’re having, she asks a follow-up question: “Do I love that?” Usually, I’m able to assure her that she does love whatever it is that we’re having, but I’m not a fool. I’ll know that eventually, there will be some resistance. At some point, she’s likely to wonder why she eats foods that other kids do not. Worse, she’ll wonder why we never feed her the special foods for kids that so many of her friends get to eat. From a child’s point of view, if there are special foods and menus in stores and restaurants, there must also be special foods and menus at home. But not at our house, at least not preprocessed “special” foods. We’ve tried to protect Mimi from the tyranny of low expectations. In restaurants, she either shares with us or we request a small plate of something from the regular menu. Decent restaurants will usually cooperate. It’s easier at home. Except when she was very small, she has always eaten what we do. Even her baby meals bore a strong resemblance whatever Jim and I were eating for dinner — softer versions of the family meal. 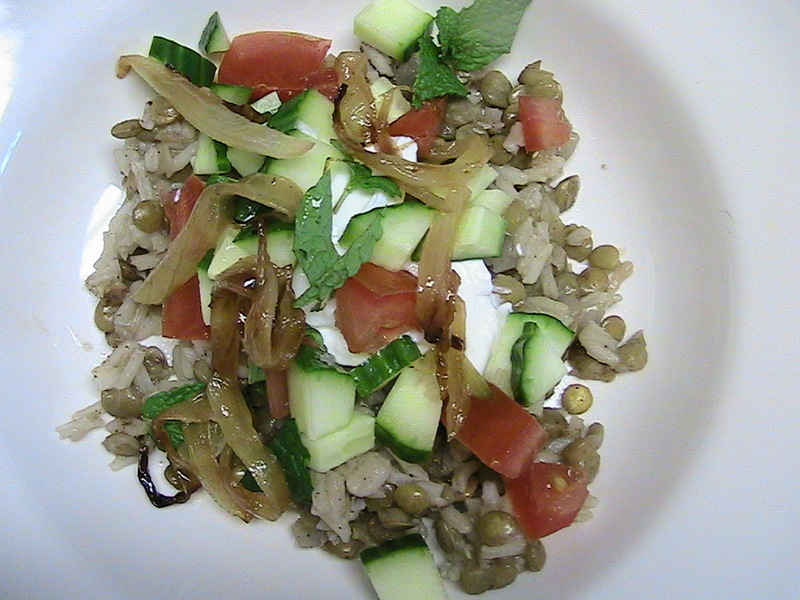 One of the first dishes that we all enjoyed together was Megadarra, a wonderful lentil and rice dish from the Middle East. Topped with yogurt, carmelized onions, and a small salad of cucumbers, tomato, and mint, the dish is complex without being confusing. It is meatless, healthy, delicious, and visually appealing. Minus the salad, it’s a perfect first “real” meal for a small child. There’s nothing to choke on and it can be rendered appropriately mushy with the addition of extra yogurt. The lentils are earthy and the basmati rice and onions, together with the cinnamon and allspice, provide a nice bit of sweetness. I served it to Mimi first without the salad and, later, with the salad on the side so she could gobble up the small pieces with her fingers. Now, she eats the dish exactly as we do and just as happily. It’s an old standard at our house, one that satisfies both young and old alike. 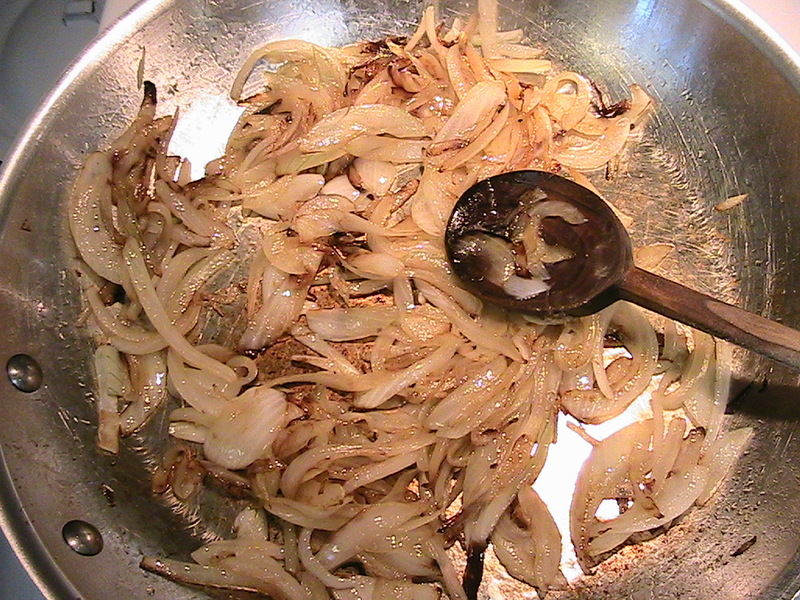 First, caramelize the onions. In a large frying pan, melt butter over medium-high heat. Add olive oil and onions and saute until the onions are soft and brown, about 10 minutes. Remove from heat and season with salt and pepper. Set aside. In a large Dutch oven, heat remaining olive oil over medium-high heat. Add onions and saute until soft. Add garlic and continue to saute until fragrant. Add allspice, cinnamon, and cumin. Stir constantly for one minute. Add water and lentils. Cover and bring to a boil. Reduce heat to low and simmer for 20 minutes until the lentil begin to get soft, stirring occasionally. Add rice and more water (if necessary) to cover). Bring back to a boil and simmer, covered, for another 20 minutes, until the rice is soft and the water has evaporated. Stir only as needed. Remove from heat. Season with salt and pepper, stirring very gently. 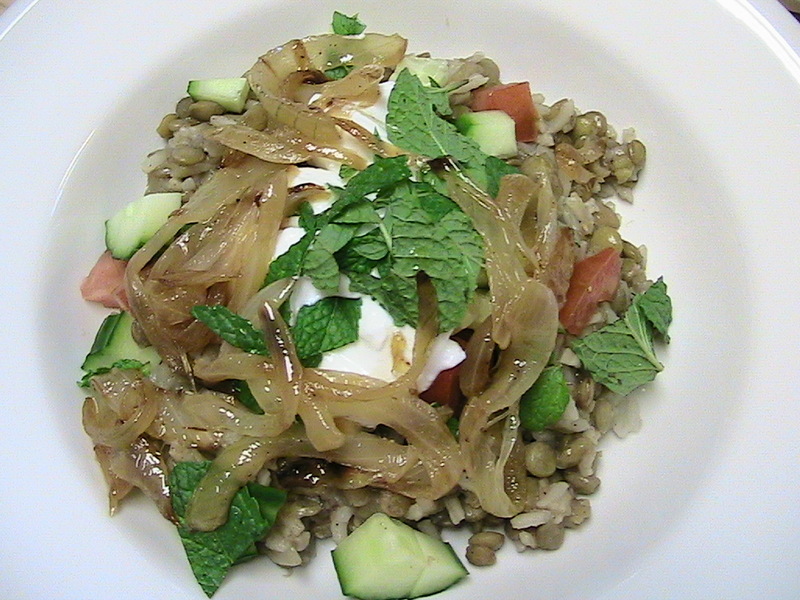 Serve the lentils in bowl topped with onions, cucumber, tomato, mint, and yogurt. That last one was a joke, but someone took me seriously. I wonder how many week-old chickens have seen the inside of this building? Well, now, at least four. By the way, she didn’t literally raise livestock in her dorm; her family has a small farm. Most of the students who participated cooked a “healthy” meal, although their idea of what is healthy is not exactly the same as mine. A couple of them used meat substitutes to make spaghetti or sloppy-joes. EEEKKK! One student gave up meat but doesn’t think that she will change her diet in the longterm, even though she learned that she could reduce her carbon consumption by 5 tons per year if she continues to go “meatless.” Her friends think she’s crazy to go without meat for even a month. When I gave the assignment, Jim worried that my students would present me with 5 tons of radishes since I made the mistake of telling them how easy they are to grow. Alas, that didn’t happen. Only one student succeeded in growing produce from seed. She did bring in some radishes, but only two (and seedlings at that). That’s okay — Mimi and I are growing radishes in our container garden and are looking forward to having a “radish party” when the crop comes in, sometime next month. Of the students who participated, all will receive the full five points except for the young woman who went fishing, caught a fish, and then let the poor beast die without cleaning or cooking it. Talk about missing the point! I’m tempted to give her zero points, but I suppose I’ll throw one at her for the effort. I’d rather throw the fish. For my part, I’ve joined a state-wide CSA and will receive my first box of produce on Tuesday. I’m very excited to see what GrowAlabama sends. I’ll cross my fingers for radishes. In America and England, you are what you think about eating. Tell me where you stand on Michelle Obama’s organic White House garden and (with the exception of a handful of “Crunchy Cons” and another handful of grumpy left-wing nostalgists for whiskey and cigarettes) I can tell what the rest of your politics are. People who are in favor of a new approach to food—even if that approach involves a return to heritage breeds and discarded farming methods—are in favor of a new approach to social life. When I first read this, I thought he was spot on, but then I started to think of really quite a few people that I know who are exceptions to Gopnik’s generalization: that is, conservatives who are in favor of progressive farming methods and liberals who just don’t care. Joel Salatin of Polyface Farms comes to mind as an example of the former. Perhaps he’s one of the “crunchy cons” that Gopnik cites as exceptions to his rule, but I’ve encountered enough folks like Salatin around here to seriously question the assumption that those who are agriculturally progressive are also socially progressive. I’ve made embarrassingly wrong assumptions about enough people based on how they think about food that I’ve learned not to do it anymore. Not all organic farmers love Barack Obama as much as I do. It’s true that I live in one of the reddest states in the nation — Alabama — so I encounter more than my fair share of conservatives. However, it seems to me that food might be an area of discourse that cuts across political divisions. Or, possibly, this “new approach to food” has become so trendy that is now divorced from its ideological origins. Both liberals and conservatives shop at Whole Foods, don’t they? It’s worth remembering that stories are powerful marketing tools. They sell products. The American food movement has given us, along with heirloom tomatoes, stories of little old ladies carefully saving their seeds from year to year and passing them down from generation to generation. It’s given us tales of bachelor organic farmers carrying contraband San Marzano tomato seeds back from Sicily in the waistbands of their underwear. Such narratives are compelling, so compelling that we literally buy them. Of course, that’s not a bad thing … not at all. I just think it’s imporant to understand what’s going on. And, as much as I admire Gopnik, I think he’s wrong — or at least not quite right — to claim that we Americans “are what we think about food.” Maybe we were nine years or so ago, but we aren’t any more. Our eating habits are not necessarily aligned with political orientation. In that way, maybe we’re just a little bit like the French, not something you can often say about Americans. One claim that does seem to be true, however, is that “we are what we can afford to spend on food.” That is, folks with a bit of discretionary income can afford to eat well — however you want to define that — and they do. Folks who live from hand-to-mouth eat that way. Some Americans simply cannot afford to be interested in “good” food. Environmentally responsible and nutritionally sensible foods should not be financially prohibitive. They should not be exclusive. However, American agricultural policy does nothing to correct this imbalance. Even under a president who is socially progressive (and married to a person who is passionate about organic food), the farm subsidies that structure food prices still do not go to small-scale farmers. They go large-scale, industrial farmers, farmers who produce large volume crops that wind up being processed into mostly unhealthy products. Until that changes, organic produce — like the produce grown in Mrs. Obama’s much-lauded White House garden — and ethically raised livestock wil be purchased mostly by the privileged few. And there is something seriously wrong with that. Spring is here! Or, rather, it’s supposed to be — the time changed a few weeks ago, meaning longer days, the equinox occurred last week, and the stores are all full of flowery frocks and open-toed sandals. The only thing missing is actual warmth, which has been elusive, and sun. Folks around here have a bit of Spring fever. I suppose they’re entitled. For the first time in recent memory, we had a real winter here in Alabama, complete with several cold weeks in a row, a bit of snowfall, and lots of rain. Having hit its stride back in January, winter seems disinclined to leave. My fellow citizens are generally grumpy about it, being used to mild winters, but I’ve been pretty happy about it. I like the cold and rain. Still, as much as I enjoy cold weather, I’ll be happy to see it leave this year. I’m tired of my winter clothes and shoes and, surprisingly, I’m even becoming weary of grapefruit and fennel, my two favorite wintertime foods. It’s time to move on, I say. So, seeking out a little bit of cheery Spring, I decided to make pesto. It’s not basil season (not even close), so I went with another green wonder: pistachios. For a bit of tang, I threw in a jar of marinated artichokes;we can pretend that it’s really spring and that they are in season. Lemon juice beckons to the sun, which will hopefully join us in the coming days. It will be most welcome. Blitz pistachios and 2 cloves of garlic in a food processor. You want the nuts to resemble coarse sand. Add salt and pepper. Turn on motor and add olive oil in a steady drizzle until a smooth paste forms. Adjust seasonings. You will wind up with about 1 cup’s worth of pesto, enough for 2 recipes. Set aside 1/2 cup — you won’t need that much — and refrigerate or freeze the rest. Sauté the remaining garlic, Aleppo pepper, and artichokes in 2tbs. oil over medium-high heat for 3 minutes, or until garlic is fragrant. Be careful not to burn it. Add the drained pasta and dried basil, if using and lemon zest. Gently toss around in the pan to coat. Remove pan from heat. Add pesto in 2 tbs. increments until the pesto sufficiently coats the pasta along with a bit of the reserved pasta water and the lemon juice. Coat pasta and artichokes thoroughly. Season with salt and pepper to taste. Add a bit of olive oil if the mixture seems dry. 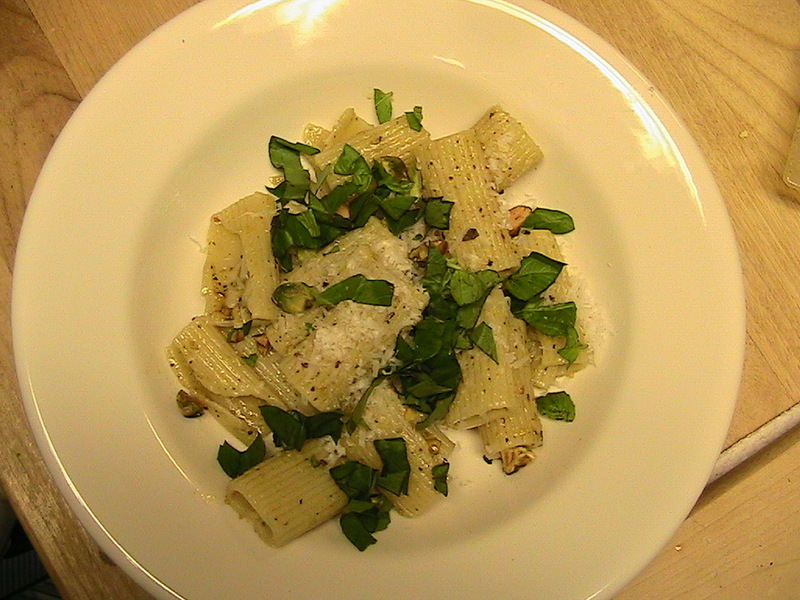 Spoon into bowls and top with parmesan, fresh basil, if using, and chopped pistachios. Serve immediately. **Pistachios are crazily expensive in the grocery store — about $6 per cup — but they’re much more reasonably priced on-line, even if you account for shipping costs. Even better, they’re fresher– much fresher. Nutsonline is a great source for pistachios and other nuts. If you’re feeling flush, you could purchase some Bronte pistachios online from Kalyustan’s but that will set you back $65 per pound (without shipping). Finally, Zingerman’s carries some prepared pistachio pesto made with Sicilian pistachios from Agrigento, but it’s also bit pricey at $30 per 8 oz. jar. Recently, a well-intentioned person offered me a piece of “vegan cheesecake.” I politely declined, but the experience rankled. I’m not opposed to vegan food by any means; however, I don’t care to eat any food that is passed off as something that it is not. What the hell is a “vegan cheesecake?” Isn’t it more rightly “tofu cake?” “Tofutti cake”? “Cheese Substitute Cake?” What? I was disturbed the inaccuracy of it all, but then I realized that I was being a purist for a cake that is itself a bit of a cipher. Broadly speaking, cheesecake is a cake made with soft, unripened cheese. Usually, it has some kind of crust, typically made with cookies or a thin layer of cake. Versions of cheesecake are found in cultures throughout world, including, unexpectedly, Asia, a fact that might challenge my aversion to the tofu cake that began this whole odyssey. In the West, humans have eaten cheesecake since around the time that Hippocrates was thinking about humors and formulating oaths. The Romans were fond of them, too, but then they stole everything from the Greeks. Of course, Italians nearly always improve what they steal, so Italian cheesecake is completely wonderful. 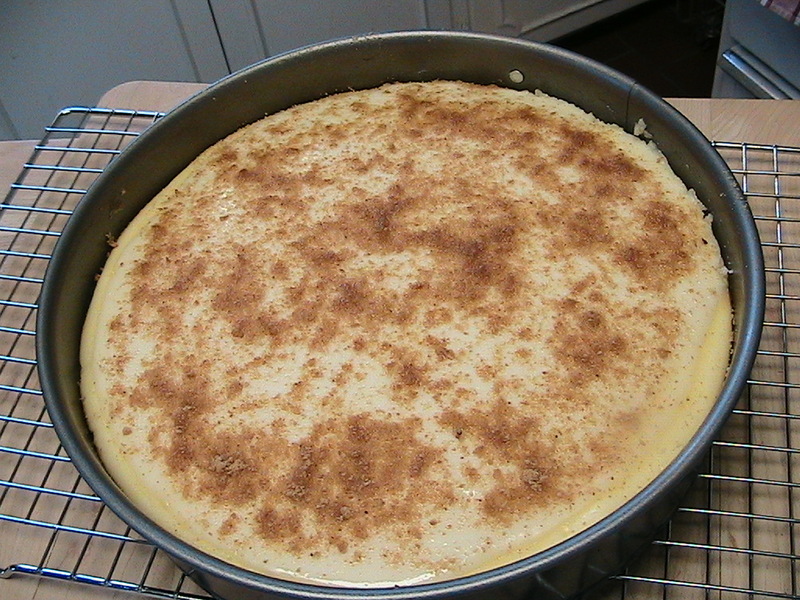 In contemporary Italy, cheesecakes are usually made with either ricotta or mascarpone cheese, which makes them less sweet than other versions. In the US, modern cheesecakes are usually made with cream cheese, often Philadelphia brand, a product that half-heartedly tries to pass itself off as Neufchâtel cheese, something it patently is not (hmmm… see paragraph #1). Specious connections aside, Philly cream cheese is highly adaptable. In fact, the malleability of this type of cheese means that a cheesecake can take a dizzying number of forms. They can be baked or not; contain eggs or not; be flavored or not. Sometimes, they are topped with fruit or jam. Less often, they are savory. I’ve had cheesecakes that were mostly whipped cream and some that were mostly Cream Whip. A beloved St. Louis version even includes butter and yeast. 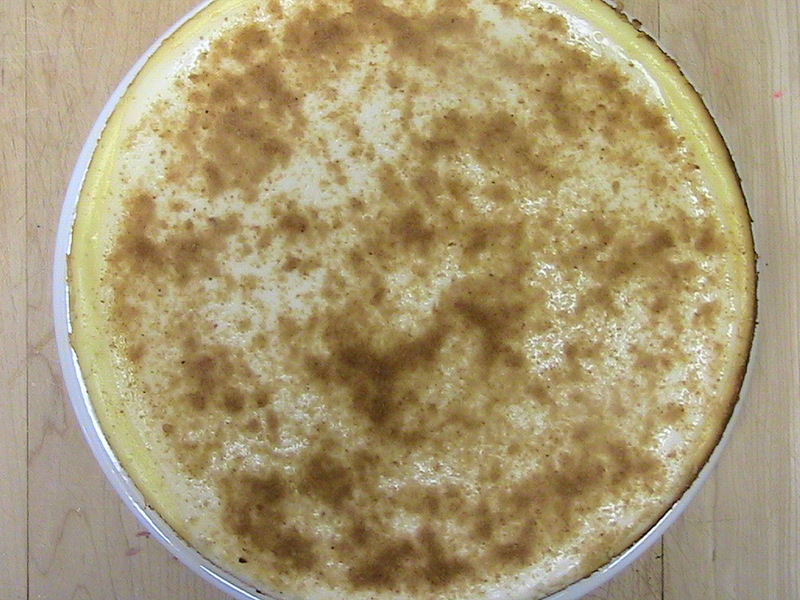 In short, the cheesecake is a highly variable platform. And, I mostly don’t care for them. So it was a bit of a surprise to me that I became obsessed with the idea of cheesecake after the tofu offer and decided to make my own just as soon as I possibly could. Given the many and varied reasons I have for not making desserts very often, I had plenty of opportunity to research the history the cheesecake and to seek out a good recipe for one. I was finally able to make my move on Monday, which is how I wound up with this gorgeous thing in my refrigerator. In spite of my general dislike of cheesecake, I can’t say enough about this one. If you’re thinking of some kind of rubbery Cheesecake Factory version, think again. If you’re imaging a creamy confection that cannot easily be cut into slices, think again. This stellar version is made with a combination of mascarpone cheese and ordinary old Philadelphia brand. 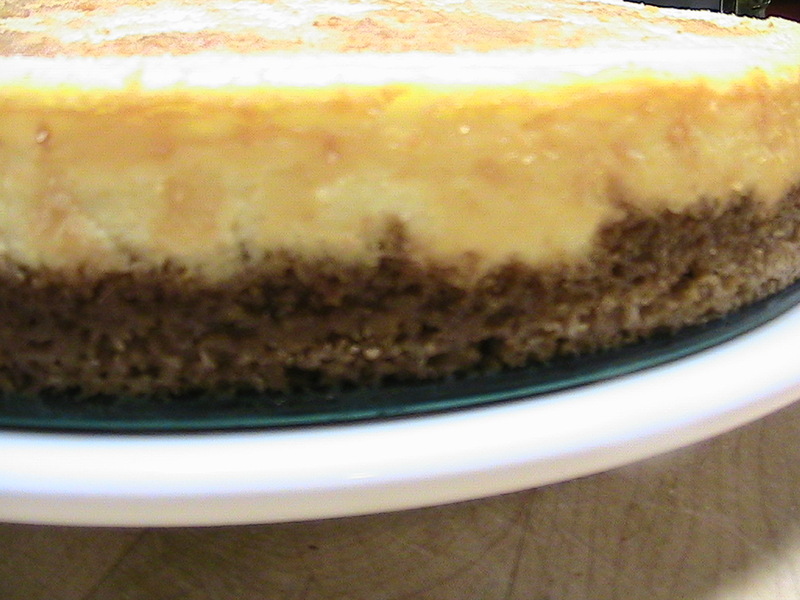 It has a graham cracker crust and a thin sour cream topping. It is beautiful and delicious. The filling was just tart enough to play well against the sweet, almost caramelized crust and the texture was creamy without being insubstantial. And, the cake was really fun to make: a bit of serious, but pressure-free baking on a sunny Monday morning. Mimi was an excellent assistant, as these photos will demonstrate. The recipe was minimally adapted from one at epicurious.com. First make the crust. Preheat oven to 375 degrees. Butter a 9 inch springform pan. Combine 1 cup of graham cracker crumbs and sugar large bowl. Reserve the remaining cracker crumbs to sprinkle over the top of the finished cake. Add the butter and stir until crumbs are coated. Press crumbs into the pan, pushing the mixture up the sides of the pan by about 1 1/2 inches. Bake for about 7 minutes, until the crust sets and slightly browned. Remove from oven and cool on a baking rack for about 25 minutes. Next, get on with the filling. Reduce the temperature of the oven to 350 degrees. In the bowl of a stand mixer, combine the cheeses and the sugar. Blend on medium until combined and slightly whipped, about 4 minutes. Add the eggs one at a time, mixing well into the cheese after each addition. Add the vanilla and lemon juice and beat until just blended. Pour the filling into the cooled crust and bake for 30-35 minutes. Remove the cake from the oven and cool for 25 minutes. When you remove the cake from the oven, don’t be alarmed if the filling wiggles a bit. It will continue to set as it cools. Leave the oven on. Now, make the topping. In a small bowl, combine the sour cream, sugar and lemon juice. Pour onto the cooled cake and spread evenly, leaving 1/4 inch of a gap all around the edges of the cake. Bake for 10 minutes, until the topping is just set. Expecting something on three of my ex-boyfriends? Think again. As satisfying as that might be for me, it would not be of much use to you. Instead, I offer something truly valuable: recipes for my three favorite dinner party starters, muhamarra, tapenade, and hummus. Served alone, any one of the three would be a satisfying way to welcome dinner guests. Serve the three of them together, however, and you will impress your guests with your worldly sophistication, easy generosity, and all around culinary brilliance. At the very least, they will know that you care. I’m not sure when I started serving all three dips together, but now I feel sort of lazy whenever I make only one or two of them. I wish I could come up with a catchier phase to call them: “the three dips?” Not exactly sophisticated. Fortunately, even if the name doesn’t inspire, the combination does. The dips belong together somehow. Sweet, salty, and earthy; red, black, and beige — however you configure them, they play well together. Besides, once you haul out the food processor to prepare one, it makes a lot of sense to prepare all three. They share a number of ingredients — garlic, lemon juice, and red pepper — so, you know, while you’re at it. I’m never able to single out a favorite. Each one tastes wonderful slathered onto triangles of warm pita (especially pita you make yourself–another post). The three distinct flavors also work really well in tandem. Besides this important fact, there are other advantages to serving the triumvirate to guests. They look pretty together on the table and they are just exotic enough to seem special. All three are vegan (or can easily be made so). Best, the dips taste best made the day before, which frees you from some kitchen prep on the day of your event. In fact, even if the dips are all that you serve, your guests will be thrilled. 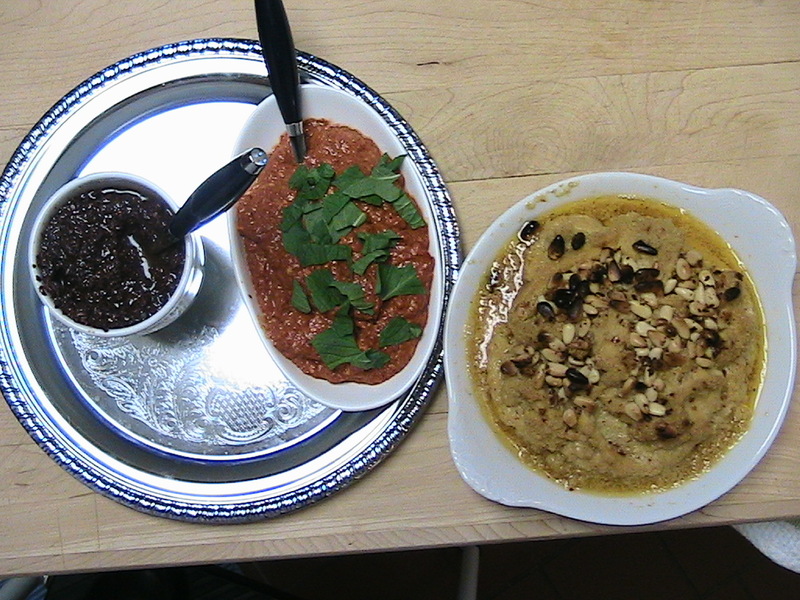 A word about muhammara, which is a traditional Persian dip. While most of its ingredients are easily found, you will need to look around for the pomegranate molasses since it is an essential component of the dish. Its flavor is both sweet and tart, a common profile in Persian food. I’ve found pomegranate molasses at Zingerman’s and the Spice House, and it keeps forever in the refrigerator. However, don’t despair if you absolutely cannot get some; either reduce 2 cups worth of pomegranate juice (you’ll wind up with about 1/2 cup of molasses) or double the specified amount of lemon juice and add 1 tsp. dark brown sugar. Finally, I recommend Aleppo pepper in all three recipes, but regular crushed red pepper makes an adequate substitute. If you do use crushed red pepper, reduce the amounts recommended by about half and adjust from there. The muhamarra and tapenade should both be fairly spicy. Put the first 8 ingredients in the bowl of a food processor and process using short pulses. You want everything coarsely chopped. Once you have the texture you like, add the olive oil in a steady stream while the food processor whizzes away. Adjust seasonings. Garnish, if you’d like, with mint leaves. Serve with warm pita. Place the first 6 ingredients in the bowl of a food processor and process using short pulses. When all is coarsely chopped, add the olive oil in a steady stream while the food processor whizzes away. Adjust seasonings. Serve with warm pita. Sometimes, I add some crumbled feta cheese to the finished tapenade. If you plan to do this, bear in mind the fact that feta is salty so you’ll want to add less salt to the tapenade. Place half of the chick peas and the next 5 ingredients in the bowl of a food processor and process using short pulses. When all is coarsely chopped, add the olive oil in a steady stream while the food processor whizzes away. Add the rest of the chick peas to the processor and pulse 3 or 4 times. Adjust seasonings. Serve with warm pita. 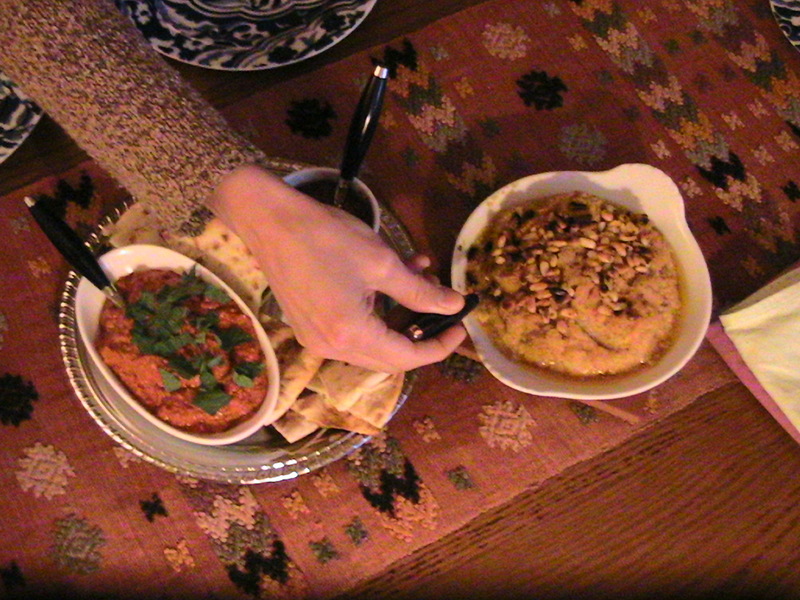 The hummus can also be served warm. If you want to go this route, make the hummus as recommend above. Then, preheat the oven to 400 degrees; put the hummus in an oven-proof casserole; melt 1 tbs. butter in a sauce pan. Add 1 tsp. Aleppo pepper, 1/2 tsp. 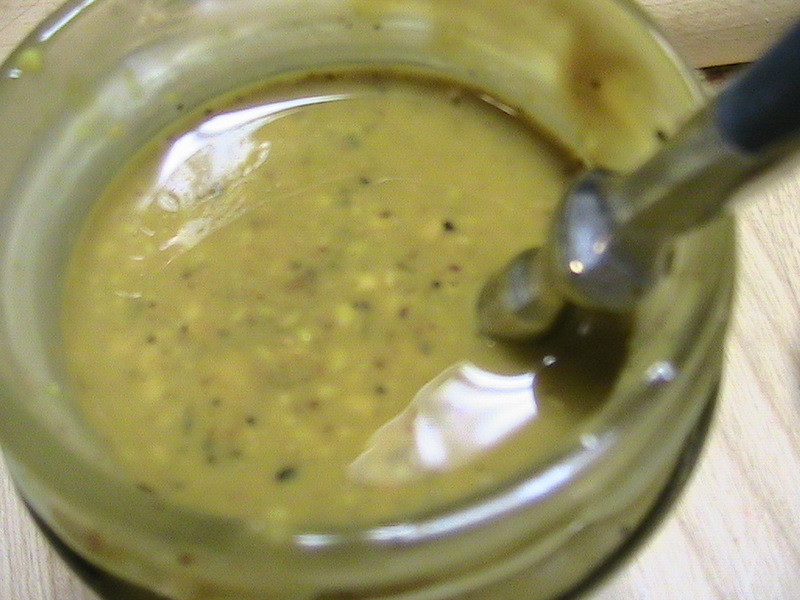 cumin seeds, and 2 tbs. pine nuts. Stir over medium heat until everything is coated with butter. Pour over the hummus and bake for 20 minutes. Serve immediately. Our friends Jeff and Karen and Scott and Laura came for dinner on Saturday and I served the three dips before this lentil soup and this marmalade cake. 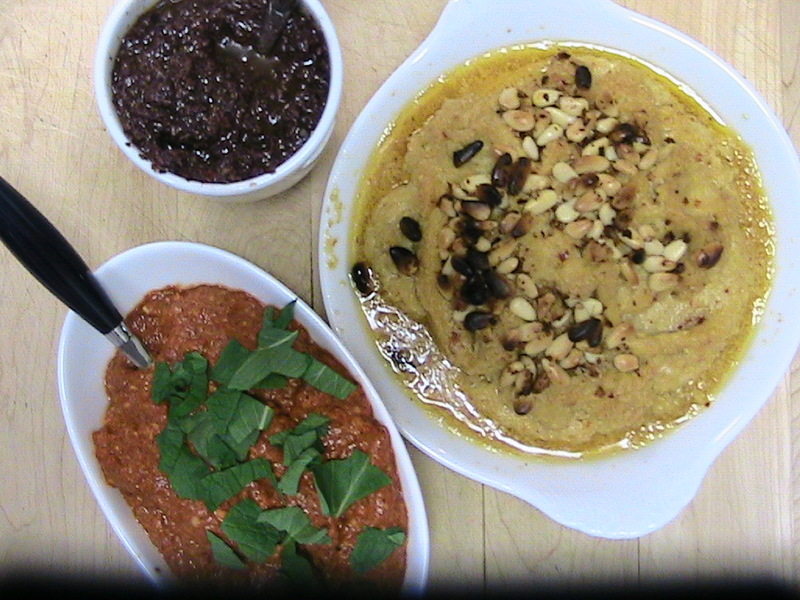 In our Straw Poll, the hummus and the muhamarra more or less tied. We finished up the hummus on Saturday, but Mimi and I enjoyed the leftovers for lunch today. It was a fabulous way to celebrate Meatless Monday.